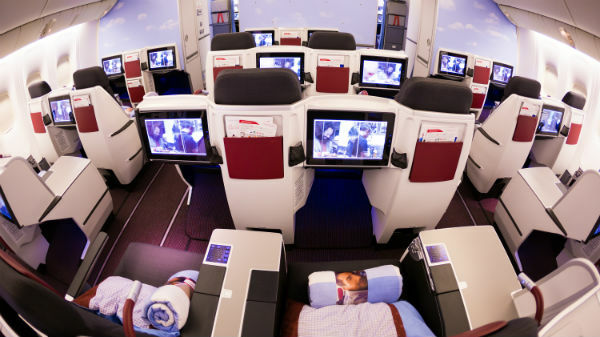 When you can't afford to fly business, use these tips to spruce up your in-flight experience. You don’t have to bag an upgrade to improve your in-flight experience. Turn your next trip into a flight of fancy with these top tips. While upgrades are increasingly hard to get, it’s always worth asking at the gate what other seats are available, although this tactic is most likely to pay off if you’re travelling solo. If there is a large amount of no-shows or the flight’s simply half full, that bulkhead seat, with its super-sized legroom, might be available even if it wasn’t before. 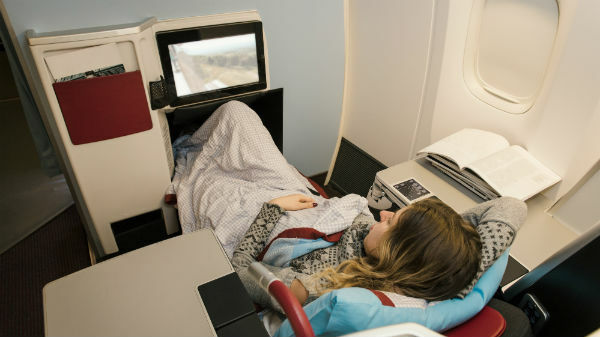 Airline staff will also be able to see if there are multiple empty seats in a row, making it easier for you to stretch out and drift off to the land of nod. 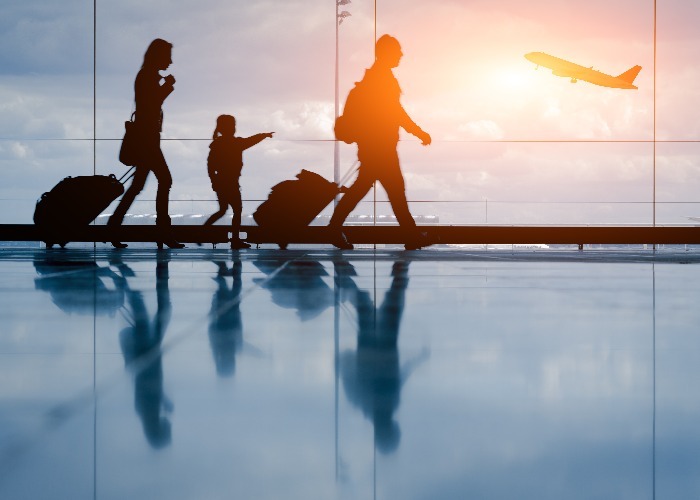 Airline insiders (in this case, a head honcho at Qantas) say that the best time to book a flight is 90 days before departure, so don’t make the mistake of waiting until the last minute in the hope of getting a good deal, or a cheaper fare for a premium economy or first class seat. 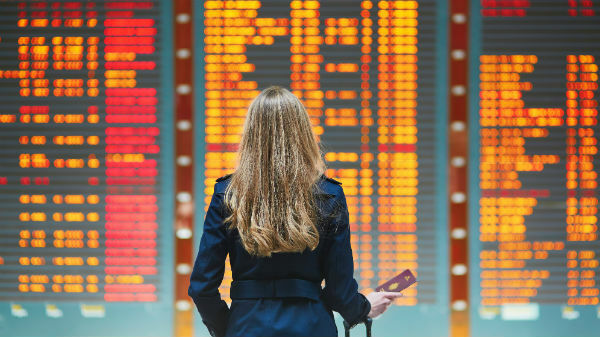 Many people have to book flights at the last minute for various reasons and airlines make a huge amount of money on these late bookings, so they’re not going to give them away for next to nothing. Nothing’s worse than seeing that blinking battery light on your laptop or iPhone when you’ve still got ten hours until you reach your destination. So don’t just make sure your gadgets are all fully charged – invest in some portable chargers, too. Ankers (lipstick-sized portable chargers designed for smart phones) are ideal for smaller gadgets, and it’s easy to buy spare batteries for items like laptops. But don’t assume that the only power points are in first class. A growing number of airlines have USB ports and sockets in all cabins. They’re not always easy to find, although they’re normally tucked beneath the seat. Just remember to carry an adaptor in your hand luggage. There’s nothing wrong with bringing your own supplies, providing you’ve got the space in your hand luggage. A pashmina or scarf will keep you warm when the pilot decides to transform the cabin into a refrigerator, and you’ll avoid the germs lurking in the blankets handed out by cabin staff. We hate to imagine what a lab scientist would find if they analysed those complimentary headphones and ear plugs, too, so bring your own versions of these. You can get headphone adapters that will convert your own one-pin to the two-pin version often used on planes. This applies to food and drink, too. Bring a packed lunch if you don’t fancy the in-flight meal, and if you love a good cuppa, bring your own teabags and ask cabin staff for hot water. Finally, instead of constantly asking for those thimble-sized cups of water when you get thirsty, ask crew to fill up the empty water bottle you’ve packed in your hand luggage. If you’re short on space, opt for a collapsible container like the Hydaway. 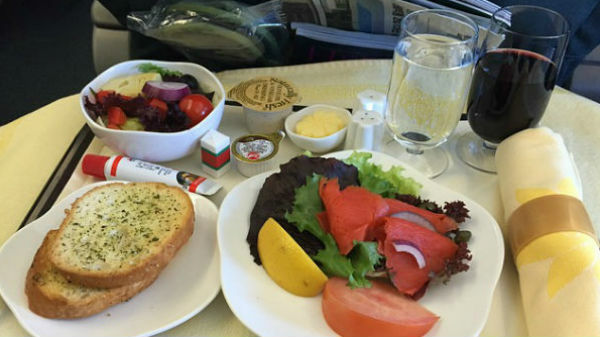 It’s a rare occurrence, but if you really enjoyed your in-flight meal, why not ask for seconds? There will always be passengers who refuse a meal so there are usually plenty of spares. It’s often suggested that if you’re smartly dressed at the gate you might well be tipped for an upgrade. But should you fail to impress enough to be bumped up, this means you’re stuck in that suit for the rest of your flight. Instead, opt to dress comfortably, or at least bring a change of clothes. Think about layers, which will allow to you to cool down and warm up easily, and flexible fabrics that won’t be too tight when you’re sitting down. If you love to kick off your shoes before you’re even airborne, bear in mind that the carpets on aeroplanes contain millions of bacteria, and the floors in the toilets are even worse. Bring a pair of slipper socks to keep your feet clean. The central area of the plane is the most stable, so if you’re sitting in this area you’ll be less likely to experience travel sickness. Just be aware that by sitting in the centre of the plane you’ll also be directly over the landing gear which can be one of the noisiest parts of an aeroplane, so if you’re a nervous flyer alarmed by sudden noises it might be best to sit elsewhere. Keeping your legs raised will reduce the risk of DVT while improving circulation. But propping your legs on the headrest in front of you is a fast track to becoming the world’s most unpopular passenger. Instead, use your hand luggage as a footrest, or invest in a Fly LegsUp Flight Hammock, a sling-like contraption that allows you to raise your legs off the floor. Air travel can be stressful at the best of times, especially for those with a fear of flying. If the kid who’s been kicking the back of the seat for the past hour is driving you insane, or your travel companion’s snoring is loud enough to wake the dead, try a little mindful meditation. Most airlines now offer audio tracks designed to imbue a sense of calm, whether it’s the sound of birds calling or meditation apps like Headspace, which can be found on many British Airways planes.